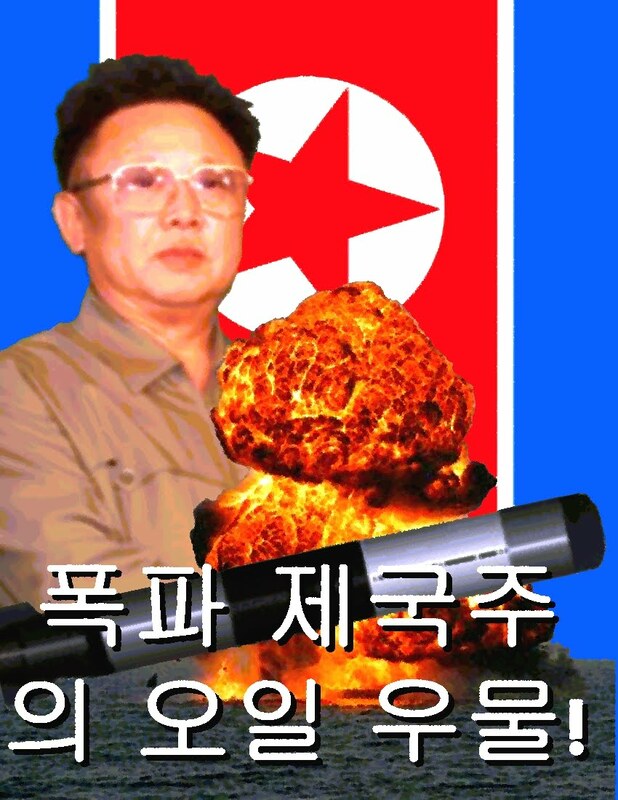 Revolution 21's Blog for the People: Curses, Kim! You've done it again! Elvis faked his death and last was seen at a Burger King in Chattanooga! 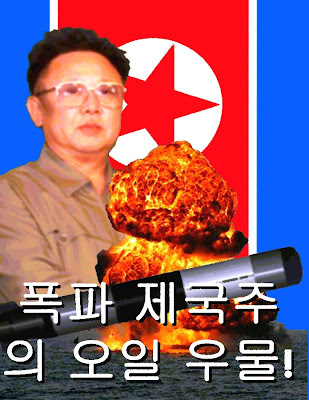 The North Koreans blew up the Deepwater Horizon! We "know" all this because right-wingers hated the Great Society, beehived middle-aged ladies and assorted weirdos couldn't believe the King could ever die, and Republicans find it more plausible that Kim Jong-il launched a minisub on a suicide mission from a freighter steaming from Havana to blow up an oil rig that . . . oh, for pity's sake! FACE IT, right-wing ideologues have gone around the bend, tinfoil hats are in vogue, and now is the time to buy, buy, buy those aluminum stocks. With tensions increasing in the region throughout 2009 and into early 2010, the news suddenly reached the world that a SKorean naval patrol ship, the Cheonan, sank off Baengnyeong island in the Yellow Sea, near the border with NKorea on Friday, the 27th of March. A close range explosion had rocked the ship. More than forty sailors were missing and later presumed dead. 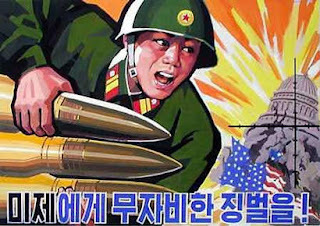 Earlier that same morning, the North's military leaders threatened SKorea and the United States with "unpredictable strikes." At first, South Korea played down any involvement with its totalitarian neighbor to the north, but gradually incontrovertible evidence emerged that the North had deployed an armed, sophisticated mini-sub into the Yellow Sea. It launched a torpedo at the Cheonan and sunk it in an unprovoked attack. Twenty-four days later, on April 20, 2010, the Deepwater Horizon oil drilling rig owned by the world’s largest offshore drilling contractor Transocean, and operated by British Petroleum, suddenly exploded and caught fire in the Gulf of Mexico. More than a dozen were injured and 11 assumed dead. Now as SKorea vows retaliation for NKorea's act of war, evidence has surfaced that NKorea may have deployed the same type of armed military submersible against Deepwater Horizon. Facts have also emerged that Hyandai Heavy Industries of Seoul, South Korea built the rig at a cost of $1 billion and despite insurance may have to write off significant losses. The oil rig explosion also has repercussions for the SKorean economy. So with one attack, NKorea could have dealt a serious blow to two of its greatest enemies. According to some reports, suspicion has fallen on a NKorean merchant vessel, the Dai Hong Dan, that left a port in Cuba the night of April 18th. The merchant vessel is the class of ship that intelligence agencies have long known can be fitted for—and has carried in the past—NKorea's two-man mini-submarines. The mini-sub, an SSC Sang-o Class submersible, can carry two torpedoes. They have been known to be transported by several classes of their warships, disguised as merchant vessels or by their older submarines. The older NKorean subs have been determined By the SKorean navy to be based on a former Yugoslavian design that the NKorean military adopted. Those 1990 versions were retrofitted to carry the two-man submersible and capable of sea launch. The newest generation of the NKorean mini-sub has stealth abilities, a longer range and can stay submerged much longer than its previous versions. According to Russian intelligence which released a report in Moscow on May 30, 2010, the NKorean vessel carried a force from the 17th Sniper Corps and departed the Cuban port of Empresa Terminales Mambisas de La Habana April the night of April 18, 2010. Although it's destination was Caracas, Venezuela, it changed course and steamed to within 113 nautical miles of the Deepwater Horizon rig. The mini-sub is estimated to have an effective range of 175 nautical miles. Then, according to the Russians, the NKoreans launched one of its SSC Sang-o mini-subs (the same kind it used in the attack on the SKorean warship in the Yellow Sea). When the stealth sub reached the offshore oil platform it fired two incendiary torpedoes at the rig's superstructure. BECAUSE ALL of this is soooooooooo much more plausible to conservatives than an oil company and its drilling partner getting greedy, lobbying against regulations requiring state-of-the-art blowout prevention, then cutting corners and screwing up . . . and blowing themselves up in a catastrophic fashion. Next thing you know, the right-wing echo chamber will be arguing that destruction of the wetlands, and much of the Gulf fishing industry, actually is a good thing. That those shrimpers and oystermen ought to thank their lucky stars that multinational capitalists applied a little black-gold tough love to their blue-collar, loser asses and gave them such a golden opportunity to retrain for much more lucrative -- and much less smelly -- careers as derivatives traders and financial analysts. Remember, no freedom-loving American capitalist patriot is worth the label if he can't believe at least a half-dozen impossible things before Rush comes on at 11.